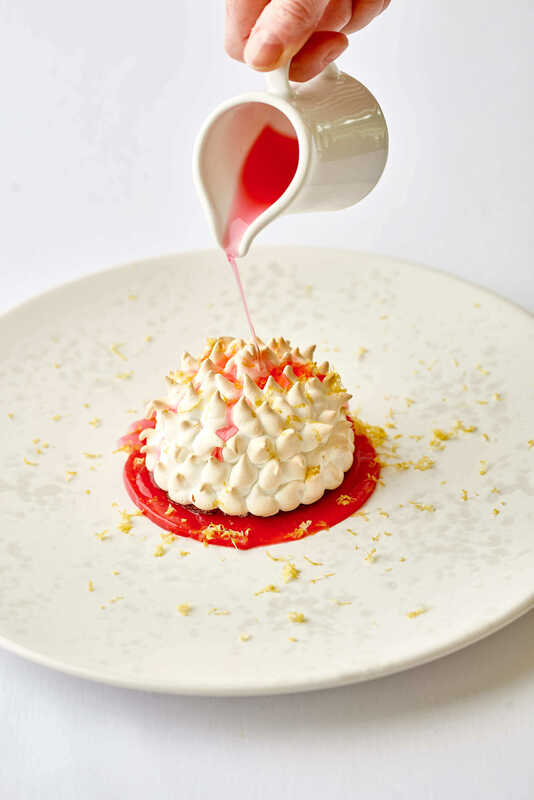 A baked Alaska screams nostalgia to a lot of us. One thing I have learnt with this dish is to keep it incredibly simple and allow the flavours to speak for themselves. 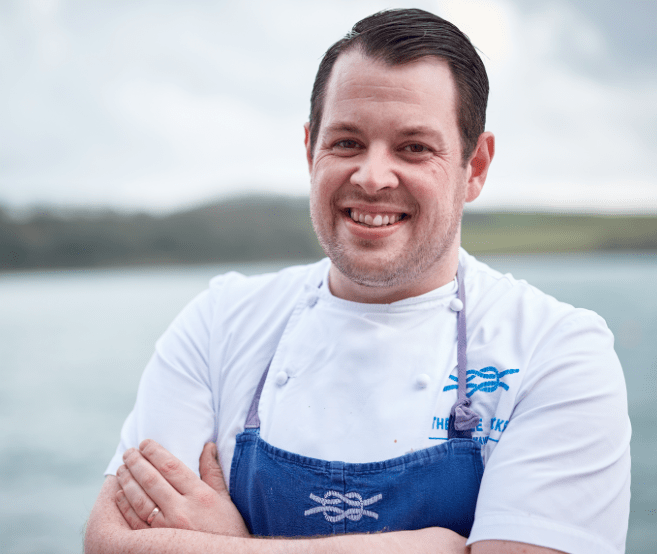 This interpretation of the dish keeps to the classic guidelines of what makes this dish so special, but encapsulates Cornwall and what can be achieved with the produce around us. The Key components of why this dish in my eyes is so well suited to Cornwall are that we use Cornish rhubarb, Cornish gin, Cornish eggs and a Cornish biscuit recipe called a Cornish fairing, a beautiful sweet ginger biscuit steeped in history. This can be done in advance. We use Cornish Tarquin’s gin for this. Take 500ml of gin, 250g of chopped rhubarb and a splash of grenadine for colour and mix them all together, then leave to infuse for around 3 days. In a mixing bowl, soften the butter then add all the dry ingredients, mix together, then add the sugar and golden syrup. Roll the mixture into 20g balls and place on a baking sheet. Make sure they are spaced apart because they will spread out during cooking. Cook for 10 minutes at 150 degrees centigrade. Then use a cutter that is about an inch bigger than your parfait moulds to cut them out. Leave to one side to cool down and then store in an airtight container until needed. Make sure the rhubarb is melted and soft. Put sugar and water on a high heat and bring to 118 degrees centigrade. When the sugar is nearly at the right temperature, start beating the egg yolks to get a light and frothy consistency. Then pour the sugar into the egg yolks whilst it is still beating and whisk for 4 minutes or until cool. Then leave to one side. Separately whisk the cream to a soft peak, fold in the cooled rhubarb puree, and then fold in the egg and sugar mix. Pour into moulds (small dome or pudding) and freeze for at least 24 hours. Peel and chop the rhubarb into small pieces. Put all ingredients into a pan and cover with foil. Leave to cook on a gentle heat until the rhubarb is soft. Strain off and keep the liquid. Blend the rhubarb pulp and add any of the liquid if you need to. This should be the consistency of a slightly loose puree. Allow to cool and keep in the fridge until needed. Once all of these components are ready, you are ready to prepare the final dish. If you are having a dinner party make the Italian meringue before your guests show up and keep it in a piping bag with a small nozzle at the end. Place the egg whites into the whisk bowl. Heat the sugar and water in a pan to 116 degrees centigrade. When the sugar mix is almost ready, start whisking the egg whites, they need to be between soft and hard peak, then slowly start adding the sugar mix. Whisk until cool. Place in a piping bag with a small nozzle. Place a small sheet of greaseproof paper on a baking tray. Take one of your Cornish fairing biscuits and place it on the paper, take your parfait out of the mould and place it in the middle of the biscuit making sure you leave a little section of the biscuit showing all the way around. Next take the piping bag of meringue and gently begin to pipe individual mounds of the meringue, making sure they aren’t too thick. Make your way around the whole parfait until it is completely encased in these little mounds of meringue. Then transfer to the oven at 180 degrees centigrade and bake for 3 minutes, or until the meringue is golden brown. Whilst the Alaska is baking, take a good spoonful of the rhubarb sauce and place it in the middle of the plate, then tap the plate to spread the puree out, this should cause it to form a neat circle of puree. Remove the Alaska’s from the oven and place in the middle of the plate on top of the puree. To finish, grate a little fresh lemon zest over the meringue and serve immediately. When at the table pour a little of the rhubarb gin over all of the Alaska, giving it a good boozy kick.